Treatment is Done and We are on the Run! 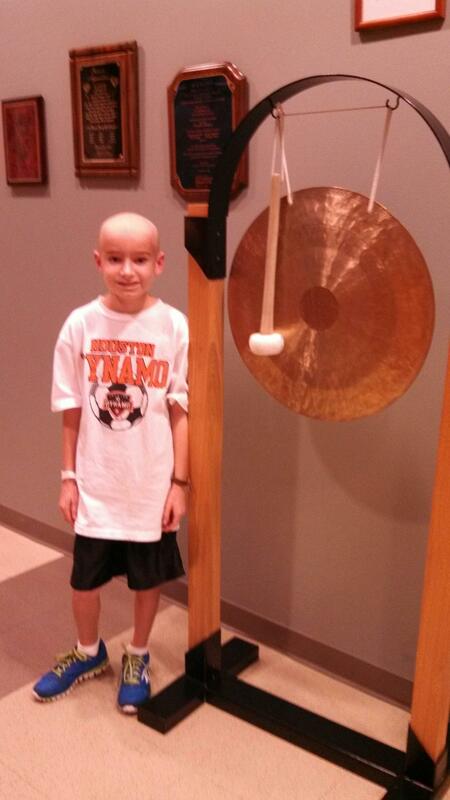 5/24/2013 | Travis the Warrior --- Kickin' Cancer! We had Travis’ last treatment today. Yeah!!! Who would have thought 7 weeks after arriving in Houston, we would be on the road home. When we look back to that first week of appointments and then the difficulties after starting the first week of treatments, it seems like a whole different world. Despite all that he has been through, Travis’ positive spirit is still shining like a beacon. He may look a little different with a little less hair then when we first arrived and he may be experiencing some stomach discomfort from the medications, but he battles on like a Warrior! After receiving his last treatment, everyone came for his Graduation ceremony. He did the ceremonial banging of the gong, received his graduation certificate, and we had a small party to cap off the celebration. We all sang: “No more radiation for you, no more radiation for you, no more radiation for Travis, no more radiation for you!” (Sung to the “Happy Birthday to You” tune). Everyone at the Proton Center has been so helpful while we were there and it was hard to say goodbye to them all. They really helped us through this and for that, we are eternally grateful. The treatment is done and we are on the run! After about 10 hours of driving (7 by Tony and 3 by Lynne) and passing through a spectacular storm in San Antonio, we are half way home in El Paso, TX!